Carpentersville is still thought of as a terrible and dangerous community that is completely overrun by migrant Mexican families. In reality Carpentersville is a diverse community of both Hispanic and white residents, in fact, 68% of the community is white (fact source Wikipedia); therefore, claims that the community is completely overrun by a Hispanic population is inaccurate, another inaccuracy is claims of high crime and the area being dangerous, the fact is the crime rate is very low in this community, making Carpentersville one of the more safer Kane county suburbs that has a sizable population (fact source City Data crime stats). The claims about Carpentersville being a troubled suburb are not completely unfounded those claims are just outdated and/or not specific enough. Carpentersville was indeed a suburb with high crime and heavy gang activity back in the 1990s but currently most of that has been put down by heavy law enforcement activity and renovations in the neighborhood making Carpentersville a safe area by the 21st century. I am not saying Carpentersville is free of crime and gangs, I am saying that the crime and gang issues are now no different than most average suburbs these days, the days of Carpentersville being above average with crime and gang activity is long gone. There are some parts that still have some higher crime than the rest of the village but even those areas are much safer than in the past. In the year 1837, Charles and Daniel Carpenter were traveling west from the east coast when they hit a snag by the Fox River during their travel that caused them to camp out in this area until the River level dropped. During the Carpenter’s stay they fell in love with the area and decided to make this land their home making them the first white settlers of the village. The brothers then wanted to create a community that they wanted to call Carpenter’s Grove. Charles Carpenter’s son Julius helped his father and uncle build a log cabin then eventually build roads and open businesses and by 1851 the town name was changed to Carpentersville named after the first settlers obviously. The Carpenter family worked hard to build the town in the 19th century especially Julius “Angelo” Carpenter that started a yarn and flannel factory, Iron and Bolt Company in 1864 and Star Manufacturing Company in 1864 which brought employment to the community which attracted German, Polish and Swedish immigrants to the village in the 1870s and 1880s. By 1887, the village was officially incorporated thanks to the work of Julius Carpenter. In the year 1954, heavy construction began just north of the village on a subdivision called Meadowdale. The construction on this subdivision was rapid as hundreds of homes were being built for budget minded home owners, as these were affordable homes that were designed to be simplistic in order to appease the home owner that was not looking to spend large amounts on extra features not needed such as a basement or a garage. The subdivision’s builder Leonard W. Besinger originally had the vision of making this subdivision into a village of its own called Meadowdale but Carpentersville wanted to annex the land and many Meadowdale residents wanted this as well. In the year 1955 the votes came in and Meadowdale was officially annexed into Carpentersville and the Meadowdale subdivision would continue construction as the town’s population continued to boom. The woes of Carpentersville began in 1977 when the village’s largest employer Star Manufacturing closed down in 1977 that employed well over 1,000 people. Many Carpentersville residents also worked in neighboring communities such as Elgin that also had their factories close down in the late 1970s putting many Kane county residents out of work. Many longtime residents began to move out of the village in the late 1970s and early 1980s and since the village was aging and not progressing, property values began to decrease making the homes more affordable for lower income residents of Chicago, primarily lower income Mexican families that sought better opportunities for their families and to escape crime and violence in Chicago. In the year 1983, as new families were arriving from the inner city some of their teenage children would not let go of their gang affiliations and began preaching the ways of the gang to Carpentersville teens, I do not know exactly what gangs were trying to recruit but Carpentersville teens were allegedly not going for it according to a January 1984 Chicago Tribune article. Carpentersville teens reported attempted recruitment and gang activity to their parents, police and school staff in 1983 and the teenage gang members were counseled that the behavior would not be tolerated and the issue went away according to the article (Chicago Tribune page 6 January 10, 1984). I am not sure if this worked in reality and I am not sure if there was any gang activity in the village in the 1980s but I do know it was well established by the early 1990s. By the early 1990s, the Fox View apartment complex (pictured) began to face serious problems with crime and some deterioration. Many low income families were flocking to this complex that often had teenage children associated with street gangs and heavy gang recruitment was occurring in the complex as the complex was facing several issues with drug trafficking, robberies and thefts. The Fox View apartment complex is within an area bounded by Bolz Road on the north, Kings Road on the south, Amarillo Drive to Ensenada Drive on the east and Williams Road on the west. The other troubled area in the village was occurring in the far north east side in an area where the street names are named after Native American tribes which is an area bounded by Navajo Drive on the north, Helm Road on the south, Sioux Avenue on the east and Kennedy Drive on the west. These two areas experienced the heaviest amount of crime and gang activity. One example of vicious gang activity in the Indian name street area, on August 25, 1992, a 30 year man was standing out on the corner of Chippewa Circle and Moccasin Lane when a carload of gang members pulled up and one of them jumped out holding an armrest from the car and began beating the man with the armrest without saying a word, he then got in the car and pulled away according to the news article (Chicago Tribune August 27, 1992). In another 1992 incident reported by the Chicago Tribune, a young 18 year old youth who was reported to not be a gang member was shot in the shoulder on Sioux Drive by a gang member named Steve Martinez over a November 1992 weekend and as the victim was recovering and seemingly never called the police, he was spotted on November 23 at a White Hen Pantry located at 109 Kennedy Drive which is right by where the Indian named streets are. Martinez and two other gang members and a female driver pulled up to the parking lot and Martinez and the others got out and shouted gang slogans at the man then Martinez shot the man then they all took off. Martinez shot the same man twice in the same week which shows how vicious the gang activity and violence was becoming in this part of Carpentersville by 1992 (Chicago Tribune November 25, 1992). In July 1993, the Chicago Tribune reported an incident of gang violence in Carpentersville that further showed to great lengths Carpentersville gang members were willing to go to show dominance. According to the news article a gang fight broke out on Morningside Lane in a parking lot which was also a rougher area of the village, in the fight was Chris Utley and Clarence Pierce who both approached two other men, one of them in the same gang as them and attacked the two of them. I could imagine the motive was that one of the guys they attacked was probably in a rival gang and was caught hanging out with a fellow gang member which can cause severe consequences. Utley proceeded to beat the rival gang member with a cut off shovel handle while Pierce broke a 40 ounce beer bottle over the fellow gang members’ head then pierce pulled out a gun and shot at him but missed. The police tracked the two down and charged them with several felonies, Utley tried to give a fake name but that only brought him an obstruction charge (Chicago Tribune Phil Borchmann July 7, 1993). The area where this happened is another rougher section of Carpentersville that had severe gang activity and high crime in the 1990s. 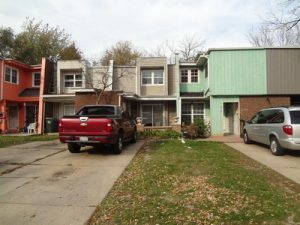 The area consists of many older and lower budget town homes in rows that are even painted different colors located within circle style streets or courts on Berkshire Circle and Morningside Lane. This section of Carpentersville still remains the highest crime area of the village. The area is bounded by Hazard Road on the north, Barrington Avenue on the south, the edge of Carpentersville jurisdiction near Helm Woods Forest Preserve on the east and Kennedy Drive on the west. By 1994, the Fox View apartments became a dangerous place to live as this was the worst year the apartment complex experienced and the worst year the entire village experienced. In the summer of that year gang violence erupted over drug turf as a series of shootings began. According to a Chicago Tribune article gang members were trying to recruit young youths to help them move drugs by offering to buy the youths gifts, one youth was offered a salary of $50 a month. At that time, 95% of the complex was section 8 low income tenants which meant that all tenants were heavily monitored according to the complex manager Ella Penalver; however, much of the gang activity and drug related offenses seem to have been carried out by non-residents that only used the complex to commit crimes such as drug trafficking in the parking lots and when a gang lookout saw police or security they would alert the gang and the gang would move to another parking lot. The article talked about a shooting where a carload of gang members pulled up to another group of gang members and opened fire on them, later on the car returned and the driver was arrested and ended up being from Bellwood, which shows that outsiders were coming in and causing violence as well (Chicago Tribune Joseph Sjostrom July 2, 1994). Residents in the Fox View apartments had grown accustomed to gang shootings around the complex and in one Chicago Tribune article published on December 13, 1994 residents were not even startled much when on December 12, 1994, shooters mowed down a 31 year old man with a hail of six gunshots to the man’s head, chest and back killing him instantly. In the article it reported that a 16 year old girl was shot in the complex that year and a massive drug turf gang war erupted in July of that year in the complex, there was also a major drug raid in the complex and a series of residents were being robbed at knife and gun point. The complex was considered the highest crime ridden area of the community in the article and efforts began in 1992 to help curtail it but obviously by 1994 those efforts were failing (Chicago Tribune Ray Quintanilla December 13, 1994). The far southeast side of town where the townhouses are was also filled with heavy gang activity and crime by 1994 and just like Fox View apartments there were many shootings in this area of town. One such incident reported by the Chicago Tribune occurred on November 22, 1994 in broad day light. Three gang members, two of them from Carpentersville, one being from that part of town got into a car and drove over to Berkshire Court (pictured) and opened fire on an apartment of a rival gang member in order to avenge a shooting from earlier (Chicago Tribune November 24, 1994). In the year 1995, the drug dealing and drug related violence happening in the townhouses in the south east side and in the Fox View apartments had at last attracted full participation from law enforcement county wide, when Operation Crack Down was launched several drug dealers were arrested in these parts of Carpentersville. It got to the point where dealers would swarm a customers’ car competing with each other to sell them the product. Police did a massive raid and arrested several dealers in the two complexes, this was the beginning of more major takedowns and heavier police presence in the village (Chicago Tribune Joseph Sjostrom June 13, 1995). In the latter half of the 1990s and into the 2000s decade law enforcement got tough on gangs and drug dealers in the village, especially in the Fox View apartments and in the northeast side in and near where the Indian tribe name streets are located. The north east quadrant eventually achieved a lower than average crime rate while crime significantly dropped near the Fox View apartments. The Fox View apartments were eventually renovated and became tougher with security and tenant screening than ever before. The southeast side of town over by the Morningside/Berkshire townhouses improved but still remains a more troubled part of the community. Over the years Carpentersville has had the following gangs operating in its boundaries: Latin Kings, Imperial Gangsters, Gangster Disciples, Four Corner Hustlers, Maniac Latin Disciples, Spanish Cobras, Ambrose and Latin Angels.